There’s no denying that education is a critical gateway to providing individuals and their families with a way out of poverty, however for the younger generation living in a remote village in the Indian Himalayas an education is in itself no guarantee of a life more prosperous than that of their parents. In his short film Lifelines, Ross Harrison documents the daily toil of Makar Singh, a 32 year old father who is compelled to leave his work in Deli and return to the village. Harrison tells us how he brought Makar’s story of daily struggle to screen. Making documentaries and travelling are two of the things I enjoy most, so I was more than a little excited when Dr Jane Dyson approached me saying she needed a short film made about a remote village in the Indian Himalayas. She has been doing research on social change there for the past 10 years – and there have been big changes. When she first visited in 2003 she had to hike for three hours from the nearest dirt road to get to the village. 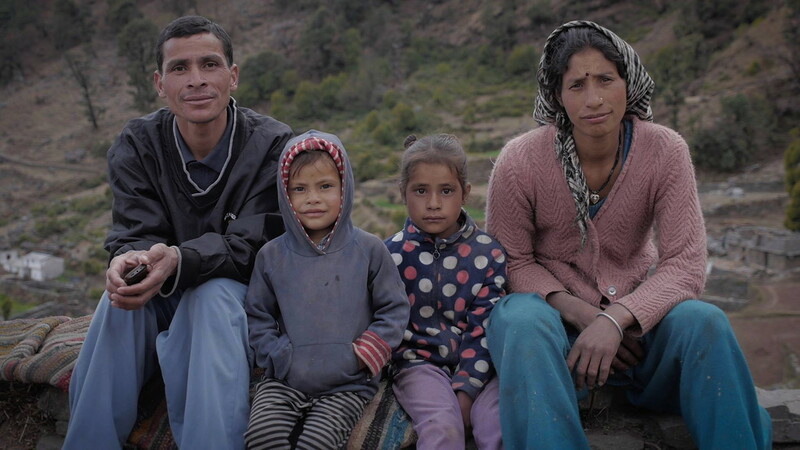 Only in the past 5 years have electricity, mobile signal, and a road reached the village, which – although they are all still very unreliable – have made a huge difference to the lives of the people there. Aside from access to new technologies and infrastructure, the younger generation are much more educated than their parents. But there is a mismatch between education and employment levels. Lots of young people can’t find work or work in jobs they’re overqualified for. I suggested focussing on one person’s story to bring to life the themes of the research. Makar Singh is one of the most driven individuals in the village so was ideal to focus on. We travelled to Uttarakhand, which is the state in north central India, in March. It took four days of travelling (2 flights, car, 4 x 4) to get to the village, and when we did we were met with this incredible rainbow. It was like turning up in some sort of magical valley. For 12 days we stayed in the village and followed Makar Singh’s daily routine of ploughing and going to school in the next village. Some mornings we went up into the forests with groups of women, who have to collect firewood and leaves for fodder. The days were dazzlingly sunny and the nights were freezing so that came as a bit of a shock to the system. For the first 4 days we didn’t have electricity so had to rely on a solar charger, which made battery-saving a bit stressful. I was shooting on a Panasonic GH3 with a rode mic. I’ve found it really portable, which is what you need when you’ve got a lot of trekking to do with your kit. I always try and bring out personal elements of a story and spend time on the cinematography too because these resonate with people who watch the film and help get it to a wider audience. We hope Lifelines will be shared with geography and anthropology students, as well as being interesting to a wider group of people online. My next documentary is called Sunset Over Selungo and is about an even more remote tribe in the Bornean jungle. That should be online later this summer.